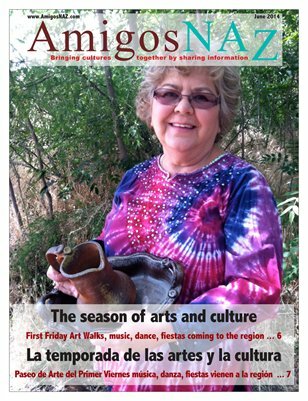 The June 2014 edition of AmigosNAZ opens with a cover story on a variety of cultural events — fine arts, music, dance and fiestas — coming up this summer in the region. The edition also includes commentaries on the aftermath of the Slide Fire in Northern Arizona, the need for continued vaccinations and specifics on the Social Security program; information on local fire restrictions, on an honor awarded to a Northern Arizona University alumni, on the annual Science Camp at Killip Elementary School in Flagstaff, on a joint meeting between the Flagstaff City Council and the Coconino County Board of Supervisors, on a public hearing to discuss a controversial student housing development in Flagstaff and on a meeting about the new Mercado de los Sueños! in Flagstaff. All this and more brought to you by AmigosNAZ — Providing information for and about the vibrant Latino community in Northern Arizona.